The Dunlop Pro are the official balls of the WSF (World Squash Federation), PSA (Professional Squash Association) and WSA (Women's Squash Association). These double yellow dot competition balls are perfect for advanced players and feature the N-1SR Molecular Technology for unmatched durability and playability. They come in a standard size (40mm) and are supplied in a tube of 3.
for submitting product information about Dunlop PRO Squash Balls - Tube of 3 We aim to answer all questions within 2-3 days. for submitting product information about Dunlop PRO Squash Balls - Tube of 3. We aim to answer all questions within 2-3 days. If you provided your name and email address, we will email you as soon as the answer is published. Best price I could find on the Net. Does what it says on the tin. Great value. One ball has split after a couple of uses, and we can by no means be classed as heavy hitters - first time this has ever happened. I got this very good deal when I purchased the rackets. So happy with my stuff! Haven't really played with any other alternatives, but these are the business. Good value, as I bought them at 50% discount when ordering my rackets too. Extra slow balls, even slower than normal double yellows!! 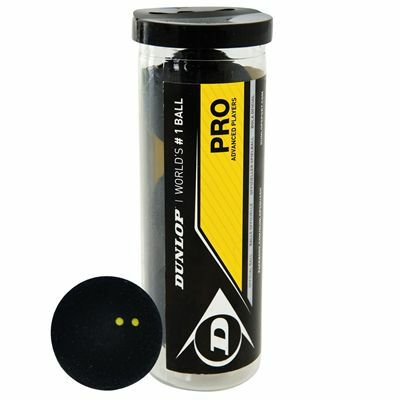 for submitting product review about Dunlop PRO Squash Balls - Tube of 3.